Description: Guilford in its early years would buy anything that ran and was cheap. 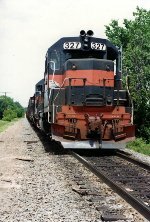 GE U boats didnt command a high resale value, and they picked up some from Conrail, such as this U33B. 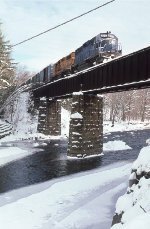 Description: An MEED-X arrives at East Deerfield and stretches across the Connecticut river at East Deerfield East. The CR power will be turned and go out on an EDME-X. Description: Power for westbound BASE (327) waits by the tower for the west end switcher to clear. Description: EBME "cooling his heels" at Susquehanna. Bet ConRail just LOVED this! Description: A former CR GP40, now B&M 327, idles away in the remains of the class yard at Mechanicville. Description: MOAY was found rolling eastbound along the old B&M and I gave chase. Description: I always enjoyed getting the highhood GP40s on the lead. 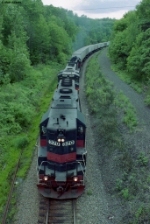 Description: Passing the old B&M tower which controlled the junction between the Freight line to Mechanville Yard (the present day mainline) and the Passenger line direct to Albany (long abandoned). Description: In a strange place for an engine, Switcher 4 ponders what it will do next. 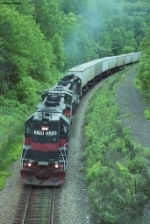 Description: A very short DJ-1 round the curve at Deering Junction. Description: POED arriving into E Deerfield Yard. The Conn River Loop branches left. 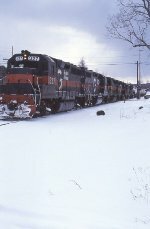 Under the nose of 327 was the switch to the Turners Falls Branch. Description: POED arriving into E Deerfield Yard. Quite the line up of power! In 2019, 376 & 643 are retired. The other units are still active but repainted.